The Wet seems to be well and truly here with the whole north covered in the rain. HAPPY NEW YEAR -- AND THE WET IS HERE! Happy New Year to everyone (we have been celebrating this Festive Season in Adelaide River in the Northern Territory where my partner Mark's family lives). Coming over this way from Bamaga, we first hoped to drive through Kowanyama and Pormpuraaw, but it was raining around Dunbar (and knowing the dirt roads that get impassable we gave up the idea in Musgrave). 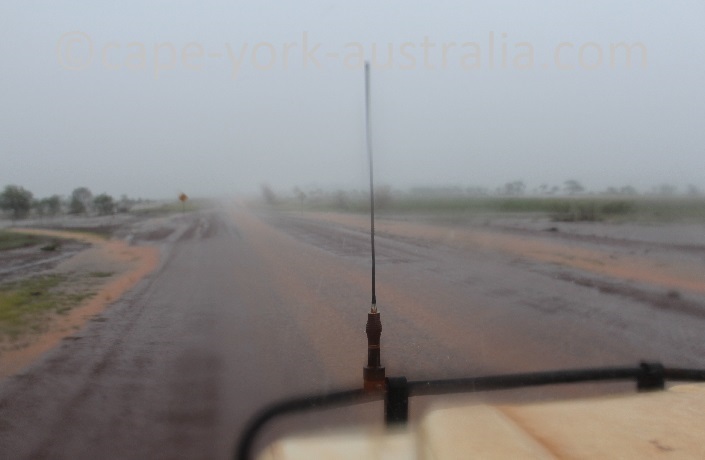 We then tried to drive through the Gulf Savannah starting from the east, and quickly found ourselves in heavy rain and in the middle of flooded fields between Normanton and Burketown. Road between Normanton and Burketown in late December 2016. The area is so low that even average rains cause flooding easy, but the rains we were driving through were heavy and widespread. The rivers were all up and the surrounding landscape was under the water as far as the eye could see. 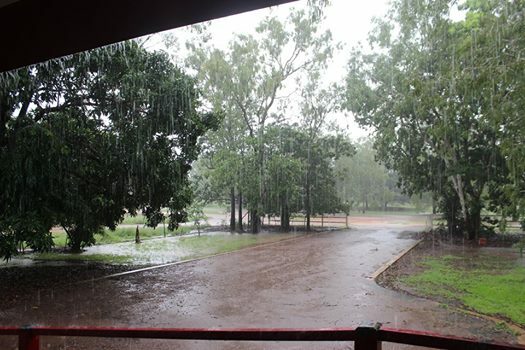 Once in the NT we had some spectacular thunderstorms (which is an early wet season thing) - but days later it all turned into constant monsoonal rains, which is characteristic to the late, proper Wet Season (if you live in this, it's a big difference - if you like read more about our northern Australian climate). 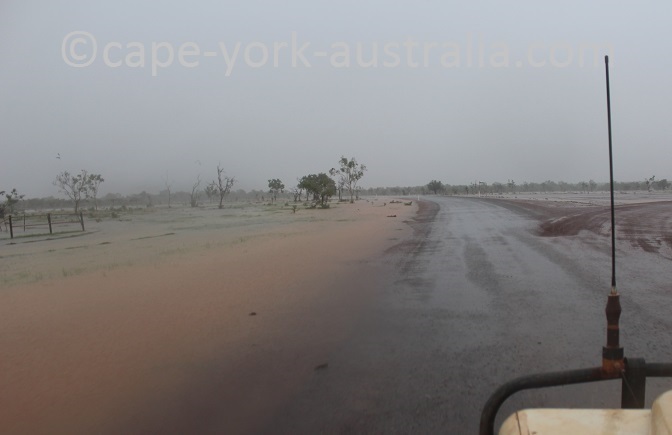 We then heard from home that Cape York was the same, at least the Tip of it where we live - it has been raining for about five days strait there now. (and here in Adelaide River by the way it rains constantly about fifth day as well, we saw the sun for a couple of hours once during this time). P.S. we will be driving back home some time around mid January and at this stage it looks like the Peninsula is wetter the further north you get (we are expecting an adventurous drive and are prepared in case we got stuck behind a river for a night or something - which everyone should this time of the year!). I will update the road conditions provided we are in the internet reception, otherwise I will do that once we are back home. I always work on the Destination Guide all year around, collecting all the bits and pieces of information that needs updating. But in the end of the year it gets more intense, and as the build-up hits late in the year, I am always spending more time in the office (yeah, in the air conditioning! ), getting all the updates in for the next year's edition. Now that we are still in the Territory at this stage - and yes - I don't really go without work even during the holiday period - so besides all the celebrations, whenever I get a moment I still get back onto my laptop now - adding bits and pieces, doing the final touches and getting everything triple checked and proof read. 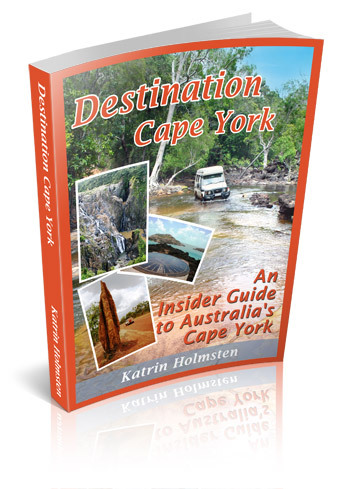 As soon as the final bits are done the Destination Guide will be out - which will now be very soon. I hope you are having a great Festive Season and Happy New Year again !!! I really appreciate any kind of feedback on the Destination Guide. Please let me know if you enjoyed it while planning before the trip, and while using the information once on the trip. If you get any questions about anything, please feel welcome to contact me. That's all for this time - happy planning, and happy travels to those on the road!! P.P.S. If you cannot see the photo banner in the top of this page, instead of photos you only see photo texts, and instead of links you see url addresses throughout the text, you are using email software that only reads text. Consider getting an email account with Yahoo or others that can read HTML (and remember to change your email address, which can be done in the end of every newsletter.